Hardy geranium. 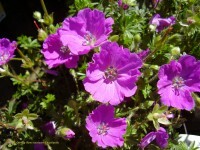 Large, flat, saucer shaped bright lilac-pink flowers are carried above deeply divided, round, deep green leaves. Height & Spread 25x45cm. Good for bees. Full sun or partial shade.